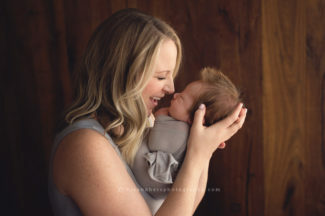 We believe your baby is a perfect creation, as is, and doesn’t require over-the-top accessories or props to capture those brand-new, perfect details. 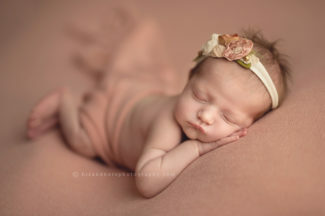 Here you’ll discover the soft tones and organic styling that make our style of newborn portraiture unique. Our studio was custom built for babies’ comfort. We have a wall of glass that allows the very best light while keeping the studio and baby toasty warm. 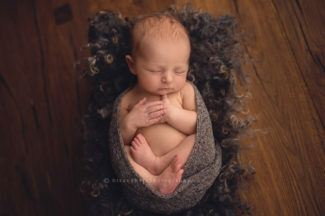 The studio has radiant in-floor heat; all the soft fabrics, knits, and special touches that we use to make baby’s images one-of-a-kind are provided. We have everything you’ll need for baby’s session here – it’s not necessary to bring anything but your little one. For our parents: we have yummy espresso drinks, tea, water, and light snacks available. We welcome you to watch movies, read, bring a laptop or tablet, or even sleep. We know you’re exhausted! Wifi is available. We want you to relax, be comfortable and enjoy this session! Sessions take place in our custom Adel, Iowa – area studio. We accept only 2 due dates per week to guarantee studio time; book early! 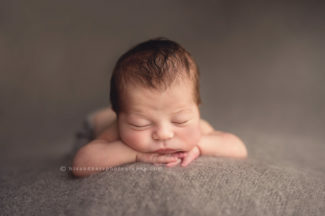 Babies photographed in their first couple weeks, typically 5-14 days old. We recommend that you book while pregnant, ideally during your 2nd trimester. Please still inquire if your due date is near or baby is here. We don’t like to turn away babies! $250 Creative Fee is a retainer that reserves your due date, covers your session, the time and talent of the photographers, as well as fine-art editing and retouching of 25 images in your gallery. Creative Fee does not include any prints or products. Albums, birth announcements, wall art, gift prints, boutique framing, and digital collections are all available. Prints start at $54. Collections begin at $790. 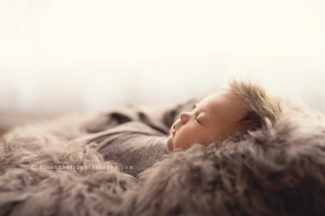 Viewing and Ordering: About 3-4 weeks after your session, we invite you back to the studio to see your baby’s images. You will see your gallery of beautifully-edited images, as well as all the gorgeous products available to you. Your order will be placed at this Viewing & Ordering session, and we will let you know when you can anticipate your products to arrive. Typical turn around time is about 7 business days for prints and birth announcements, longer for specialty items such as albums and frames. Getting real, beautiful images of your loved ones on the wall is something that is important in our own home, and we know it’s important to our clients as well. We have scoured available vendors and discovered products that we’re proud to show in our studio, home, gift to love ones, and we believe you’ll love them as well. We offer swoon-worthy wall art, gift prints, albums, canvases, fine-art folio collections, custom frames, holiday cards, and birth announcements. While digital collections are available, we are artists and our goal is to provide artwork; we can’t wait to show you all the gorgeous products! We know sharing online is important to you, which is why we gift web-sharing images of the artwork you purchase as gift prints or wall portraits for you to share on social media. There is no charge for these web-sharing images – it’s just a courtesy we provide so your loved ones can see your favorite portraits. Copyrights of our artwork remain with the artist. Our artwork may not be scanned, photographed, screen captured, edited, cropped, manipulated, altered, filtered, sold, or used without our written permission. This is our livelihood; we appreciate your integrity. Ready to book your baby’s portraits? Wonderful! We’d love to be part of baby’s first days! Please contact us to start planning your session.